And I walked in under the butterbean tent. And made a nice little house for me. And all outside was a cool green street. And a cricket-like thing that could hop went by. Of bugs that could go like little clocks. A long, long while in the butterbean tent. I’ve read a lot of poems since then, both silently and out loud, and the line “And all outside was a cool green street.” is still one of my favorites. At age 19 or 20 I remember going to a reading by the poet William Everson at the public library in Sacramento. The room was dark but for the spotlight on the poet, and as I felt the attentive hush settle on his listeners, it seemed we were the only ones in the world, and the world was telling a beautiful story just for us. Poetry readings carry that kind of bedtime story magic for me even today. When Mike came along, I embraced my role as the reader of bedtime stories and poems with gusto. I enjoyed doing voices for Rat and Mole and Toad from Wind in the Willows, and Pooh and Piglet and Eyore from the Winnie the Pooh books. When Mike was 4 years old, one of his favorite poems was “Hungry Mungry” by Shel Silverstein. He knew some of it by heart, and would say it along with me. Even though I read to Mike as a little boy, he’d never heard me read my own poetry out loud. 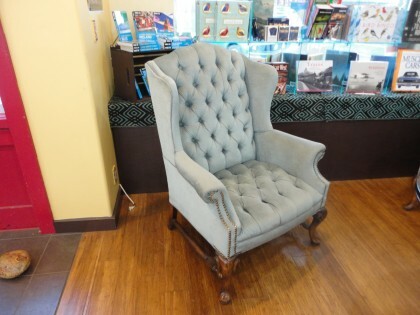 So you can imagine my absolute joy when Romeo and I walked into BookPeople of Moscow last Saturday night for my slot in Local Author Saturday and saw him sitting in this very chair. I could hardly believe my eyes as they teared up with joy. He had convinced me in e-mails that their car was still mysteriously malfunctioning on long distance trips, when he had actually found a mechanic who could finally figure out how to fix it. He wrote that he was so sorry he would miss the reading. He would be there in Spirit. He hoped I would knock ’em dead. And so forth. He totally and utterly faked me out. I’ve always enjoyed reading in public, from way back in grammar school,on into teaching, and the opportunities I’ve had to read my poems in public. But it’s been over 17 years since I did that, so I wasn’t sure how it was going to go. Once I got started, it was like they say about riding a bicycle. And I had a great audience. Many friends from different parts of my Moscow life made the effort to come out, and all the chairs were full. Another wonderful surprise of the evening was that BookPeople of Moscow sold all but one of the 15 copies they so graciously preordered. I was even asked to sign a few in the bargain. I didn’t think to bring my camera or ask anyone to take pictures, and afterward Mike said his phone had gone dead, so there are no photographs of this momentus occasion. But I will never forget the sight of my son in that chair, waiting for me to see him, or in the audience, listening attentively to me read my work. Or how after, he was clearly and warmly impressed, and even confessed to tearing up at a couple of poems he knew the inside situations of. I was getting my reading “sea legs” while reading this first poem, and I can hear that in the recording. But all in all, it’s not bad. And after that one, I found my stride. It helped to have a great, attentive audience, just as having a great attentive readership helps me keep writing my blog. 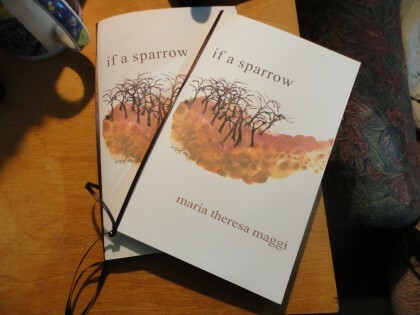 If you are one of the kind readers who preordered If A Sparrow, you can expect it to appear in your mailbox soon. My editor at Finishing Line Press wrote me this past Monday that she expected all the preordered copies to be out in the mail by the end of this week. Thank you for your support and your patience in waiting for it to arrive. While it may not seem like much of a victory to get up and read a few poems in front of people, for me it is very much a symbol of a return to better health. First of all, it means I could sustain and integrate the mental, physical and emotional focus and stamina needed to hear and write the poems at all. Then I could concentrate more to organize them into a cohesive unit. Then I could persevere further and struggle triumphantly with the technicalities of putting them into acceptable manuscript form. Then I could figure out how to submit them to a contest where I would be lucky enough to win the distinction of being published and to have my own art on the cover. Although I could not do these things quickly, I was able to do them. It also means my body temperature is stable enough to attempt a public appearance. It means my throat is strong enough to project my voice. It means the nerves in my face are calm enough that I can smile and talk without wincing in pain. It means my left hand can hold the book open, and write something inside when asked without putting it in a special position or wearing a support. Though I needed to sit down for a few minutes after walking to the bookstore in anticipation of the reading, on top of the surprise of seeing Mike, I never once worried if my legs would buckle under me. And I was lucky to have Romeo at my side the whole time. The last time I read in public 17 years ago, I had just been diagnosed with MS. Although they were kind, my colleagues were not optimistic about my prognosis. One inscribed a book she gave me with the phrase “in gratitude for your life.” In a way it seemed to imply my life was soon going to be over, but instead I took it as encouragement to keep on living because someone was grateful I was here. Another, when I mentioned that people don’t die directly from MS, blurted out, “No, you’ll just wish you were dead,” then gasped and covered her mouth as if she had not meant for such a remark to escape it. The night of my reading nearly 18 years ago, I had to leave the dinner party given for me beforehand and lie down in order to be able to stand up and read for half an hour. I didn’t know if my legs would buckle under me on the way to the podium. My bladder and gut were both functioning very poorly. The week before the reading, I had to visit an occupational therapist to learn new ways to support my left arm so I could hold the book open to read and sign copies afterward. I had to wear a special hand and wrist support to be able to do that. I had to work to project my voice enough to be heard. I had to be careful not to swallow wrong and choke. And I was utterly weak and exhausted afterward. This time I walked home, warmed up some leftovers, visited and laughed with Mike in front of the fire, and made us each an itsy bitsy fruit cobbler. While I am “back” to reading in public, I have not returned to the academic life that once ordered my days. But that’s okay. It’s the making of the words into the poems and being able to read them out loud that counts. And after I was finished reading, people asked me questions. Would I talk about my process in writing the poems, working in the sonnet form, what inspired me? So in a way, it was a little tiny “class.” I got to talk about things that matter to me in my creative process, like how being able to walk every day fuels it. And earlier in the reading, when it came time to read “Old Fashioned Oats,” I got to thank the doctors I’ll never meet who made my standing up there to read it possible with their groundbreaking work about how to eat. And much to my surprise, everyone loved that poem. Among my happiest early childhood memories are those of my mother reading me the poets that taught me to love poetry: A. A. Milne, Robert Louis Stevenson, Carl Sandburg, among many others. For me, being read to became synonymous with feeling loved. It was such an honor to be able to stand up in front of so many people I cherish in my community and return the favor by reading my own poems out loud again. Such slow miracles are the poetry of my life. I am so happy for you and just excited that soon your book of poems will be here for me to read. I love that Mike fooled you and made it after all – you are so lucky to have such a loving son and daughter-in-law to boot! I used the my car is giving me problems lie on my Mom once too – funny you folks fall for this, lol! Thanks for this lovely feedback. I really appreciate all you shared here. The car “ruse” WAS very real for months on end. . .so it was easy for me to fall for it. And Mike wanted to be sure he made it here without having to disappoint me. Great all around. 🙂 So glad the poem was a mirror for you too. Hope the copies start arriving in mailboxes real soon. your poem was lovely BUT I was so sure you would have an English accent. I don’t know why, but you just look like you should have an English accent. Hi kally, thanks for this comment, which made me laugh out loud! English major I was, but English accent, no, born and raised in Sacramento California. 🙂 Thanks for being such a wonderful reader of mine, and for your warm congratulations. I received my books this AM so happy!! I think Kally’s comment goes along with my visual conception of you just stepping out of a Jane Austen novel. Beautiful post, Maria! I’m glad Mike tricksterly made it out to your reading, and that it went so well. Reading about your experiences truly is inspirational – you turned everything around by simply eating the right way. All the naysayers and doctors can’t negate that truth. Every day I’m so glad I found your blog, as your words have helped me deal with my diagnosis, giving me hope and faith that I’m doing the right thing, and that I will be OK. When I get panicky or down, I think about your stories. Little miracles each and every day. It definitely is a victory that you got up there, and I can’t thank you enough for sharing your slow miracles. I look forward to getting my copy of your book! It was so amazing to hear the detailed then-vs-now/now-vs-then accounts of your reading experiences. And amazing. I am stunned at the one person’s accidental comment of ” you’ll be wishing you were dead” but certainly that was an accident on her part. And not true! I am so glad you chose that path you did, and that you are where you are now. I am always struck, when I read your posts, at how there is no doubt in my mind as to the power of diet to heal. And at what healing gives you, and everyone – the gift of living life, really *living* it. once again I was so pleased to read your blog.so thrilled that your son fake you out. so happy for you that you WFPB diet is really working. I’m looking forward to my copy. Thank you so much, Marge–for your faithful reading, and for anticipating your copy of the book, and being on the journey with me here. Wow! Congratulation! I can’t wait for my copy to arrive. Thank you, Kathleen! I’ve heard from two people who got their copies in the mail, so hopefully you’ll get yours soon too! it was wonderful to hear your voice. I was astonished, somehow expected a different ‘type’ of voice. After reading your blog, reading about your history I definitely did not expect so strong a voice! Thank you for sharing and congratulation! Thank you, Silvia! I’m glad you enjoyed the surprise of hearing my voice! Hi Maria, I love this post. I too was read to as a child, and often. My mother read many poems to me; and I, in turn, read them all to my daughter. I still read poetry, often. But you know, it’s odd: I cannot bear being read to now! I’m a very visual person, and it just works better for me to see the words in print. Or maybe something else is the reason. If not, you might wish to glance through it. It’s a collection of spiritual poems, from all faiths, I think. The website owner, Ivan Granger, is a poet himself. Welcome, Pat, and thank you for this lovely comment. I so enjoyed reading that you shared the same kind of childhood experience and passed it on to your daughter. There is definitely something to be said for reading silently from the page itself. Sometimes that is the only way to go for me, too. It just depends. But reading out loud still has a special magic for me. Thank you for the web site link. At first glance, I love the definition of the chaikhana, or teahouse–it really resonated with me. I look forward to looking through the site more extensively. Congratulations, Maria! It was great to hear you reading again. I, too, am looking forward to receiving my copy of ‘If a Sparrow’ soon, though it will take a while to ‘fly’ South! I hope many will ‘flock’ to read your magical poems!! Those ‘slow miracles’ of yours continue to inspire me. Thanks. Thank you, dear Kiwi Fan!! I hope your copy makes it all the way South soon! And it’s a joy to know my slow miracles inspire you. p.s. I see now after completing this that I was responding to one of your other blog entries via a link on this page..the one on “rainbows”..oh well..going to submit anyway..hope you don’t mind. Welcome, Kathy, and thank you so much for this beautiful comment!! No worries about it being on a different entry than you meant. I am in the part of my morning where I check my e-mail and what a lovely lovely surprise for your words to be the first ones I opened!! I always love to hear that someone is reading and how and why my words are meaningful to them. I loved hearing how you like to whistle and had a favorite uncle who used to whistle too. There is so much available to us right in the moment if we are willing to even try and be present. I so appreciate your grasping my feeling of connectedness with my readers–it’s very real–I do feel that, and it’s a blessing. Well days and continued miracles back to you, Kathy. Fastness of that leafy screen. And pink and yellow four-o’clocks. Communing in a golden hour. I cannot reach there bloom at all. And roofs and streets, to find the bees. I might know what the winged things know. And I would sing them all for you! Of moon glory and wind grace. Will you not come and visit me? And grant me grace, and make you hear! I hope this poem brings you as much joy as it does me. Some poems are like hands reaching through time to convey a very special gift. Louise Driscoll does it exceptional well in this poem. She is “granted” the grace and I am made to “hear”. I rejoice in your victories. So many are so dull they do not see even the ones they have so easily. ” ‘only’ doeth wondrous things.” We have look,really look, really listen. It’s all very wonderous. It should not surprise me you are a poet. Remember I told you the thing I noticed most about you, was your way with “words”. You handle them like an artist. Praise GOD! Enough said for this evening.